The Ahwahnee Hotel (temporarily known as the "Majestic Yosemite Hotel" due to a trademark dispute) is the only manmade structure in Yosemite that's a tourist attraction in its own right. It's a beautiful building with a striking, instantly recognizable exterior that blends happily into its surroundings, and it has equally compelling indoor spaces - be sure to check out the famed dining room, with its 34-foot beamed ceiling, and the lounges filled with overstuffed chairs, Native American prints, and fireplaces that could fit not just Santa but the sleigh and seven or eight of the reindeer as well. It's just the sort of rustic yet tasteful and iconic lodge you'd build if you had all the money you really deserved. (A really, really large amount.) It is, deservedly, a National Historic Landmark. Celebrities and Royalty: If you're famous and you haven't stayed at the Ahwahnee yet, what's the matter with you? 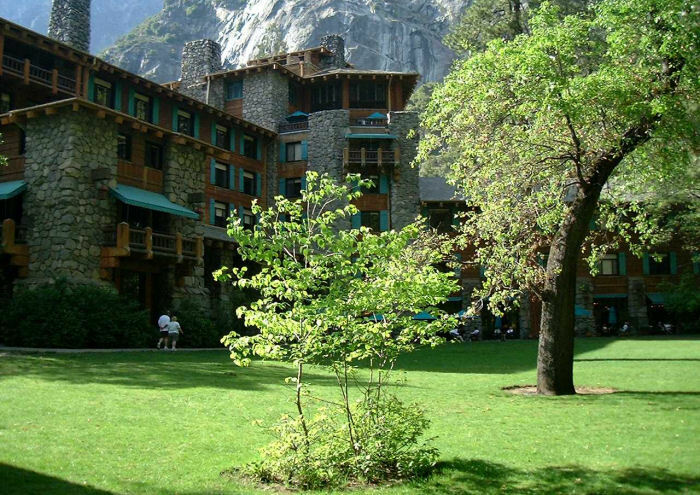 Your public has certain expectations, and let's face it, the Ahwahnee would look gorgeous on you. A far from complete list of entertainers who've slept here includes Brad Pitt, Lucille Ball (while filming The Long, Long Trailer), Judy Garland, Mel Gibson (while filming Maverick), Charlton Heston, Douglas Fairbanks, Jr., Joan Baez, Boris Karloff, and Kim Novak. John F. Kennedy stayed here, as did Herbert Hoover and Eleanor Roosevelt. The Ahwahnee has also been a temporary home to a host of royalty, including Queen Ratana of Nepal, King Baudouin of Belgium, Ethiopian Emperor Haile Selassie, and most famously, Queen Elizabeth and Prince Philip in 1983. Lodging: You have three options at the Ahwahnee. More accurately, you have three options if you're rich. If you're not particularly well off, you might consider a fourth option of just exploring the public rooms and grounds without expending a mortgage payment on actually sleeping here. Standard rooms in the Ahwahnee start at around $500 per night, as do the Ahwahnee cottages. The suites start at around $650. Dining & Shopping: The Ahwahnee's dining room is famed the world over, at least as much for its architecture and views as for its food. You'll have to dress up for dinner here. There's also a smaller bar & restaurant at the opposite end of the hotel, where you can get sandwiches and cocktails and sundry. If you're eating at the latter restaurant, you can also be seated out on the patio, as happy a place to enjoy a meal as you're likely to find in the summer. In addition to the restaurants, there's a small gift shop where you can secure vital sodas and candy bars. There are also two souvenir shops in the Ahwahnee, one that's mildly expensive and one that's proudly so. Location: The Ahwahnee is in the northeast end of Yosemite Valley, at the edge of Ahwahnee Meadow. Follow the signs to Yosemite Village, and once you pass the village store, turn right on Ahwahnee Drive, which will take you directly to the hotel. Weddings: It's hard to wander through the Ahwahnee Hotel on a summer weekend without inadvertently witnessing a wedding ceremony on the lawn or accidentally drinking somebody else's champagne in the Great Lounge. It's worth getting married five or six times if you can have all of them at the Ahwahnee. You can request a wedding reservation here. Swimming: There's a pool about the size of your kitchen off the east end of the hotel. If you're jonesing for a brisk swim, try the larger pool at the Yosemite Lodge, or possibly the Pacific Ocean, which is only 200 miles to the west. Though the pool here is small, it's perfectly situated outside the bar so that you can have drinks on the patio while still keeping an eye on your kids or your sweethearts as they see if they can leap all the way across the pool. Getting Rooms: The Ahwahnee usually fills up months in advance for the peak season, roughly May into October, and for special events (see below). You have better chances of getting a room in the winter. If you're set on a summer stay, hit the reservation website a year ahead if you can. The Bracebridge Dinner is a four-hour, seven-course meal that takes place near Christmas in the Ahwahnee's grand dining hall, which is transformed for the occasion into a virtual 17th-century English manor, based on a mashup of Washington Irving stories. It's taken place every year since 1927 (except during World War II, when the Ahwahnee served as a Naval hospital). Ansel Adams was an actor in and director of the entertainment for many years. The Chefs' Holidays are a series of cooking classes in January and February. The hosts are renowned chefs (if you happen to be a person who can name famous chefs) from around the country - for some reason, it's not hard to lure talent to Yosemite. Culinary demonstrations in the Great Lounge are followed by five-course meals in the Ahwahnee Dining Room. The Heritage Holidays, begun in 2002 to celebrate the Ahwahnee's 75th anniversary, are three days of concerts and dance classes, culminating in a dinner and ball where celebrants in vintage costumes from the first half of the 20th century dance to swing music. There's also a fashion show wedged into the schedule. The Heritage Holidays usually take place in early March. For the Vintners' Holidays, beginning in November, a select group of California winemakers leads winetasting seminars and hosts receptions, and at the end of the day the participants try to find their way to the Ahwahnee dining room for a five-course dinner. More Ahwahnee: How many hotels have had books written about them? At least one, I can report. If you're thirsting for more Ahwahnee knowledge, read The Ahwahnee: Yosemite's Grand Hotel by Keith S. Walklet. It includes a detailed history of the hotel and lots of photos, and it was a primary source for the celebrity information on this page. It's available from Amazon and at many of the shops in Yosemite.